The Florida rapper is scheduled to be released from jail on August 16 or August 17. After pleading no contest to charges that included robbery and fleeing from a police officer, Kodak Black was sentenced to one year of house arrest and five years probation in a Florida court on Tuesday. The Pompano Beach rapper, who was facing as much as 55 years in prison, will be released from jail on either August 16 or August 17. 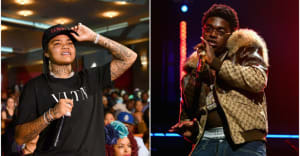 Atlantic Records' executive vice president of business and legal affairs Michael Kushner was among those called to testify on Kodak Black's behalf in court, telling the judge that the 19-year-old "has a very bright future as a recording and touring artist."